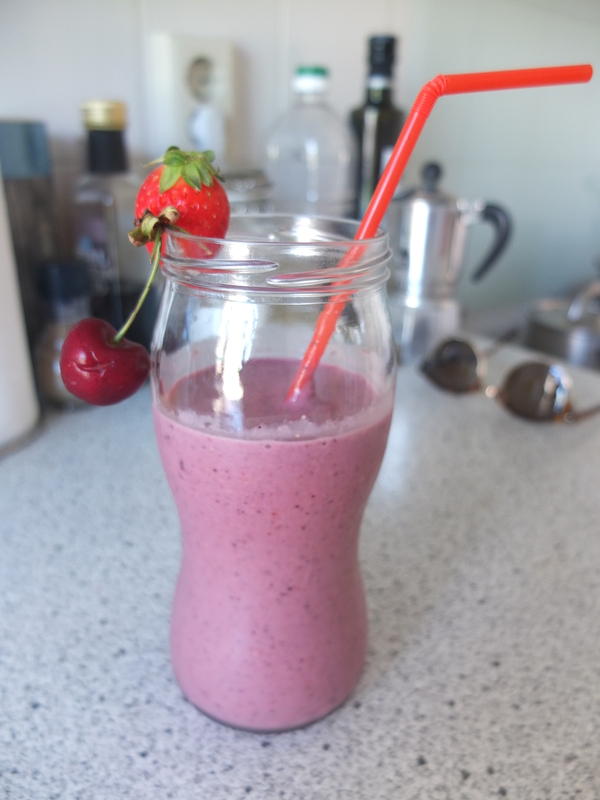 As you probably guessed already, since I am posting a placenta smoothie recipe, I already had the baby. And the placenta. Her name (the baby’s, we didn’t name the placenta) is Vera Jo, she is awesome (obviously) and was born on the 11th of June, at home. I am going to write down her birth story at some point this week, but since I haven’t written or posted here for ages, I thought to warm up with a shorter post. First things first: Why on earth would anyone want to consume their placenta? I happen to have written a post a few years ago that explains everything in detail, but in short it’s supposed to help with postpartum recovery on many levels. Let me be clear: there is no scientific research when it comes to placentophagy. There are just many many women who have consumed it and claim that they have seen benefits. Many women believe that it helps slow down the hormonal dip that happens naturally around day 3 postpartum, helping reduce the chances of heavy baby blues or even postpartum depression. It is also supposed to help boost energy levels, which to me makes sense, as it is basically meat and full of B vitamins and iron. It is also believed to help build a good milk supply quickly. My personal approach to it was that you only get the chance to eat your placenta only a few times in your life and since I wasted my first one (we forgot it out of the fridge for too long), this time I wanted to seize the opportunity. Also, it can’t hurt, so why not? Before you decide to consume your placenta, it is important to make sure it is healthy. Ask your midwife if it has white spots (which I think are calcium spots and mean that the placenta has started to age), if it was delivered whole, if they have administered drugs to you during birth, that affect the placenta. Even if you think she will be horrified/disgusted, it is a good idea to be honest about your intentions to consume the placenta, so she can inform you in case you shouldn’t because of health concerns. There are a few ways you can choose from to consume your placenta. Most women choose pills. A doula can do that for you or you can do it on your own. Personally, I think that making pills is not ideal because it needs a lot of processing (the placenta needs to be steamed/baked/dried first and then crushed so quite a few nutrients are lost). The benefit is that the icky factor is reduced by quite a bit and you can keep them for many many years. 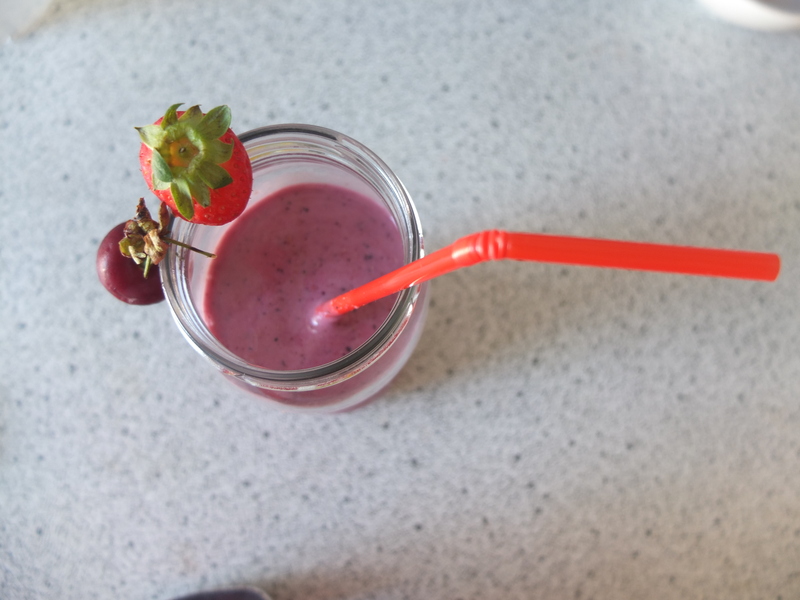 You can also choose to drink placenta smoothies the first week and encapsulate the rest of your placenta. You can even cook it, like regular meat, with herbs and spices, but of course the heat takes away many nutrients as well. 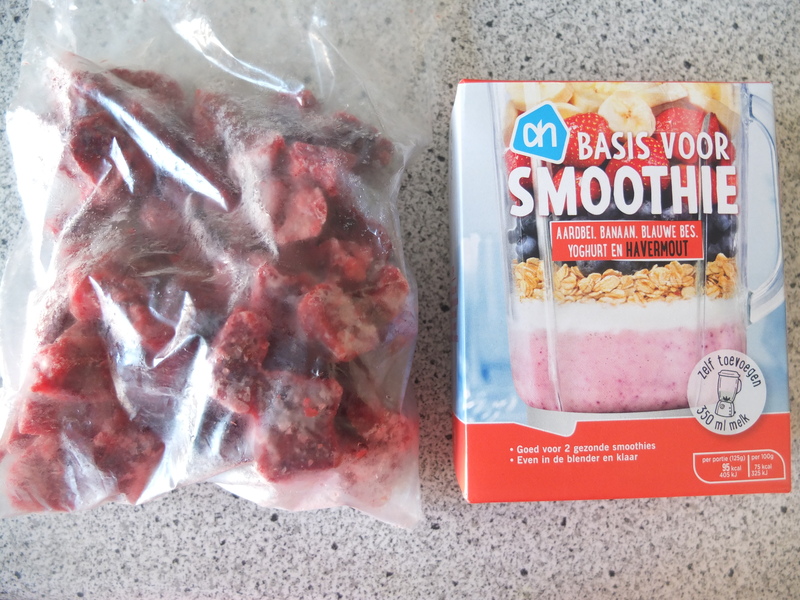 Following are instructions and pictures of how I make my own placenta smoothies. If you are squeamish, you might want to avoid scrolling all the way down. That’s where the placenta pictures from the birth are. Though my guess is that if you are here reading this, you are probably past the (slightly childish) stage of thinking placentas are gross. The first step is to remove from the placenta the umbilical cord (you can let it air-dry and keep it as a keepsake) and the amniotic sac. Then it’s a good idea to rinse it thoroughly for a few minutes, so that most blood comes out. Some people like to sprinkle it with salt and leave it in the fridge overnight and then rinse it. I didn’t do that. Then, once the placenta is washed, you can chop it in pieces. 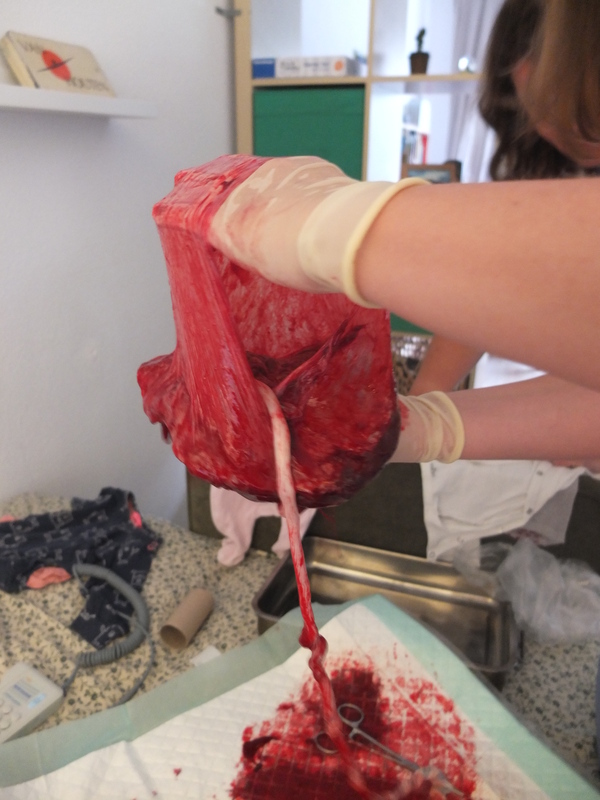 You can see in the pic how big I cut the pieces of my placenta. Some people cut them super small and then ingest them like pills with a glass of water. I had decided that I only want to consume it in smoothies, so that size was handier. I put two of these little cubes in each smoothie. 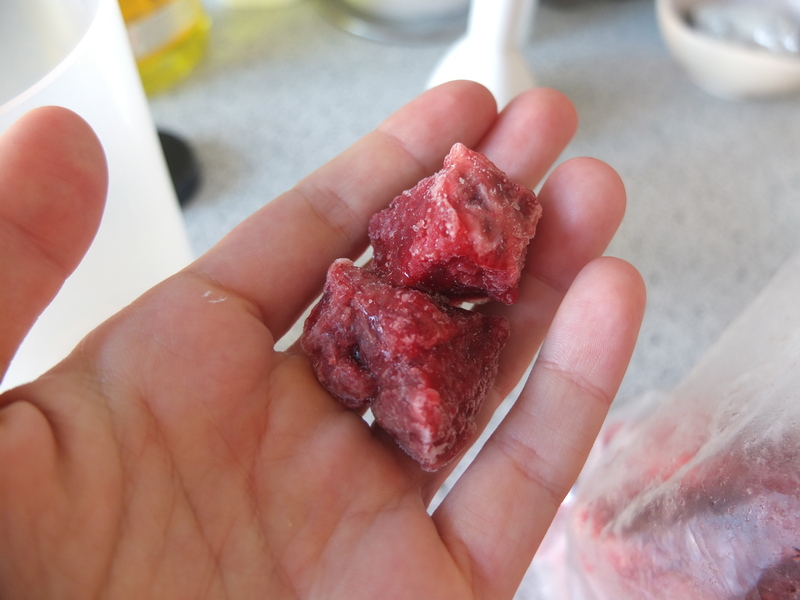 Once you chop up the placenta, put the pieces on a piece of baking paper and freeze them for a couple of hours. Make sure they don’t touch each other, otherwise it will be hard to break them apart later. 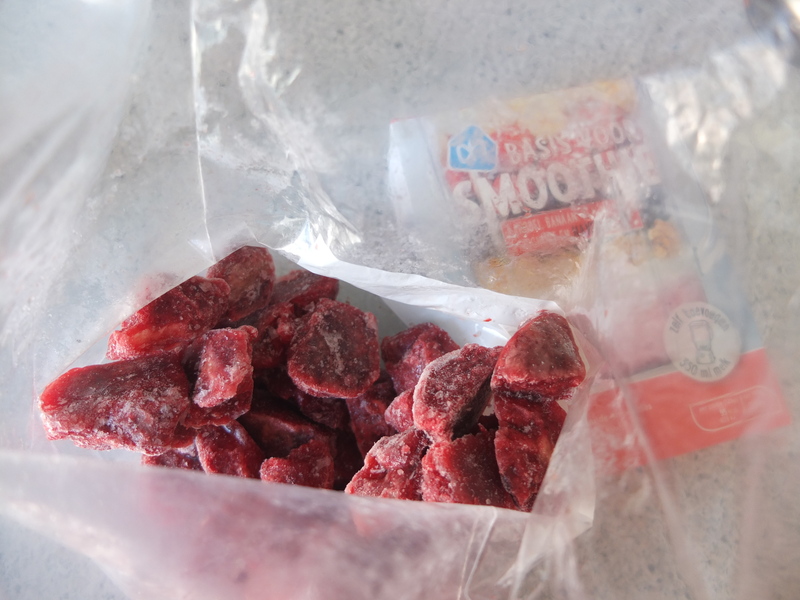 Once they are frozen like that, you can transfer them in a freezer bag and start using them for your smoothies. You can use whatever fruit and vegetables you like but adding strawberries, raspberries, cherries and/or beets is a good idea. That way you won’t have to think that the red color comes from the blood. Also, a banana covers up pretty much any taste and makes smoothies nice and creamy so adding one is a good idea. Yogurt and avocados also guarantee a nice texture. I like to use frozen fruit along with the frozen placenta. I feel that the low temperature also helps cover up any taste. I have drunk 8 smoothies so far and I swear I haven’t tasted anything strange at all. I mean, they taste just like normal smoothies. No placenta taste whatsoever. I promise. 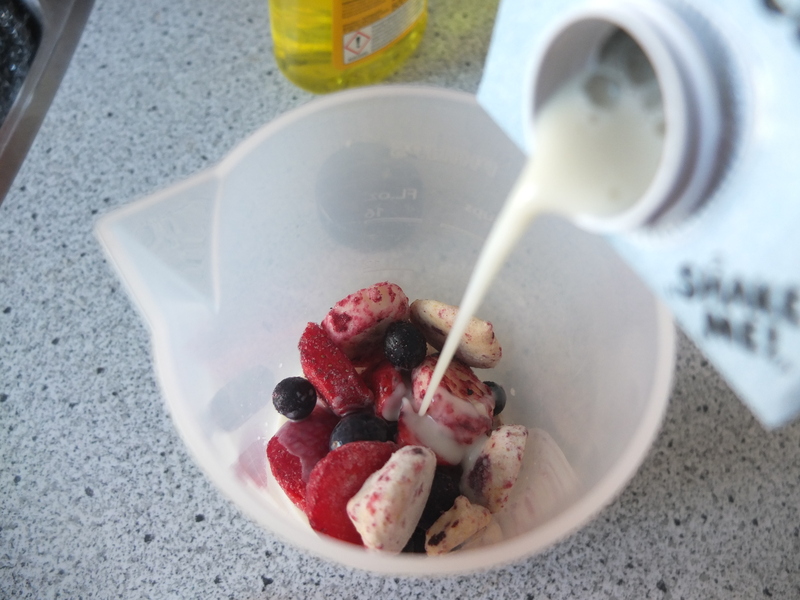 I like to make my smoothies with oat milk and add some oats in there too, as they help promote/boost milk supply. I just use a simple hand mixer to make them and it works quite fine. Just make sure to blend for a minute and then give it a rest, especially if your placenta pieces and fruit are rock-hard. If you have a stronger blender/food processor feel free to go crazy with it. 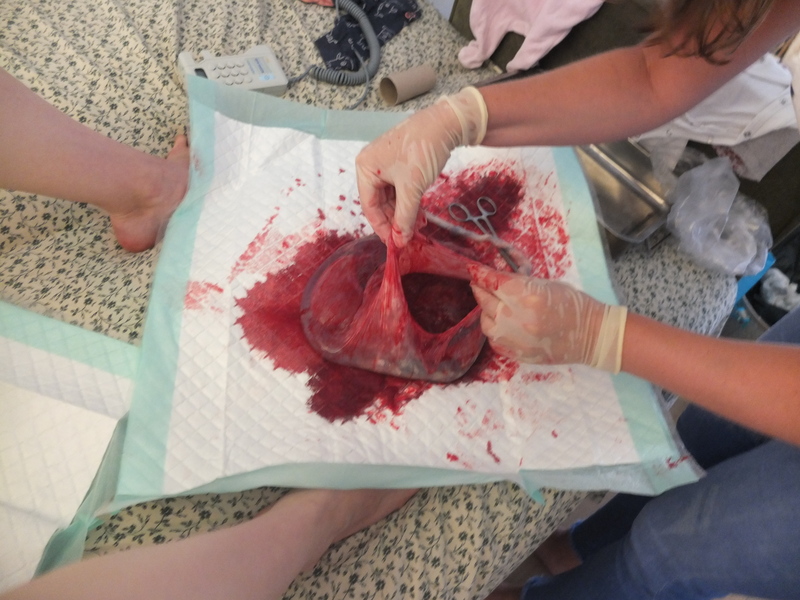 In these pics the midwife shows the amniotic sac. For those that are absolutely clueless about birth, the long, thick string-like thing is the umbilical cord. Sure, the sight is bloody but miraculous non the less. So do I feel better this time around? It’s hard to tell, because like the first time around, my mom is here to help and support us. This means I can focus on breastfeeding and spending time with Loulou Maya as well. Nikos is also very supportive and I have a small but strong network of friends I feel I can rely on, once my mom is gone. This is SO important for the postpartum period. The emotional aspect of having a community to turn to is invaluable. But my milk did come in fast (could be because LM has been nursing during the whole pregnancy and still does) and I have significantly less postpartum bleeding. My energy levels are also high, but the unusually sunny weather (for Dutch standards) might have something to do with it as well. In any case, I would recommend to expecting moms to keep and consume their placenta because a) it can’t hurt and b) it always freaks people out (even midwives) and that’s always fun (and there aren’t many ways to have fun during the postpartum period).